The Mill, Brimscombe Port, Stroud, Gloucestershire GL5 2QG. Another book brought out to commemorate the lives of professional cricketers killed during the Great War, this superb book should act as a fitting memorial to the cricketers who fell during the war as well as giving an excellent overview of England both before and after the war and some of the events during the conflict. Based on the English county season of 1914 which started with great promise but ultimately ended prematurely after the outbreak of war and not to return for almost five years, this excellent book brings back to life the cricketers who took part in the aborted season and recounts the effects of the following four years. 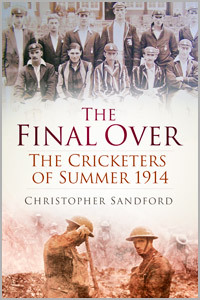 Christopher Sandford has written wide-ranging biographies from sportsmen to actors as well as, amongst others, Conan Doyle and Houdini and, whilst The Final Over might be considered a fairly glum if worthy and necessary subject to take on, Sandford manages to combine appreciations of the fallen cricketers with an insightful overview of England both before August 1914 and after November 1918. Twelve Test cricketers died because of the conflict and it is perhaps surprising that seven were South African. Sandford, through access to diaries, expertly bases the book around cricketing legends including Colin Blythe, who died during the conflict, and the somewhat eccentric Lionel Tennyson, who survived. The diary entries tell the tales of the horrors, hardship and effects of the war. Percy Jeeves, the man behind P.G.Wodehouse's fictional and famous butler, is also an important subject of the book as is Hampshire's Robert Jesson. Despite the naturally sad and harrowing appraisal and ages of those killed, Sandford also brings an element of joy – away from the war battlefields – so that an otherwise sad and tragic subject becomes a most gripping and informative book on England in the first two decades of the twentieth century. Many cricketers did survive to live long and fruitful lives and there are quotes of some cricketers who received the call to arms whilst playing cricket along with their responses. We learn of the views of the public and W.G.Grace ( who died at the age of 67 in the second year of the war) amongst others that, after the declaration of war, their thoughts that cricket, for a while at least, should be discontinued. Many cricketers, like other professions, signed up. Some didn't and Jack Hobbs was one who may initially have underestimated the war's impact. That said, Sandford also expertly brings to life the adventure which most young, eligible and ineligible men willingly signed up expecting the conflict to last six months and that they would return to England to resume their normal lives. As we shall see, the horrors took hold and England, even after Germany's defeat, became a different place. There are many fascinating cricketing events mentioned. One German corporal took part in a game of cricket but described it as non-German and thought little of the use of pads. Whilst not a major name in the Great War, this Austrian-born and subsequent Teutonic terror would, within a decade certainly become well-known. His name was Adolf Hitler. There are stories of temporary cessation of hostilities during which British and German soldiers took part in a game of cricket and also cricketing activity at Gallipoli. In this centenary of the outbreak of the Great War, we have indeed been fortunate in the high quality of cricketing literature relating to the Great War which ensure that those cricketers who fell during it have their memories preserved and remain in the public conscience.